Figure 17-5. DA Form 55-161 (Airbrake Defect Tag). Home > Transportation Reference and Training Manuals > > Figure 17-5. 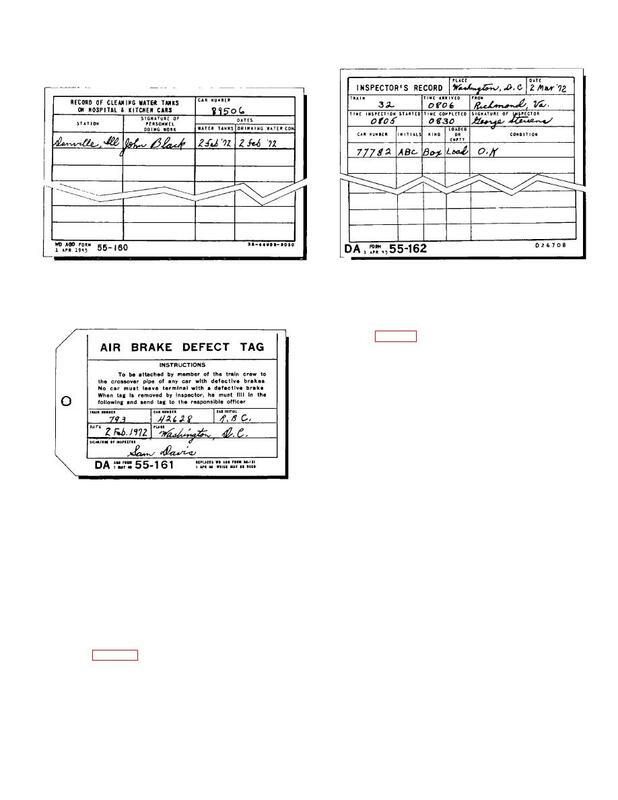 DA Form 55-161 (Airbrake Defect Tag). Figure 17-7. DA Form 55-163 (Car Inspector's Train Report). Figure 17-6. DA Form 55-162 (Inspector's Record). Water Tanks Hospital and Kitchen Cars). whether the car is loaded or empty. b. The side of the card having the words "Bad Order"
repair or the heavy repair track. car repairs in the railway operating battalion. cards will be placed on boards provided for this purpose.